Coimbatore: Three apps and technology solutions developed by the B. Tech students of Amrita Vishwa Vidyapeetham in response to the challenges posed by several ministries have won top awards at Smart India Hackathon (SIH) 2018 organized by the Govt. of India. While two of these solutions – related to the Ministry of Defence and Ministry of Commerce & Industry, respectively – bagged the top Awards and cash prizes of Rs one lakh each, the third for the AYUSH Ministry got a special award in the Students’ Innovation category. The annual event, considered the largest hackathon in the world lasting a gruelling 36 hours, allows various departments of central and state governments to engage with over one lakh technical students from different universities across India, and challenge them to build digital solutions to improve their efficiency and plug revenue leakages. 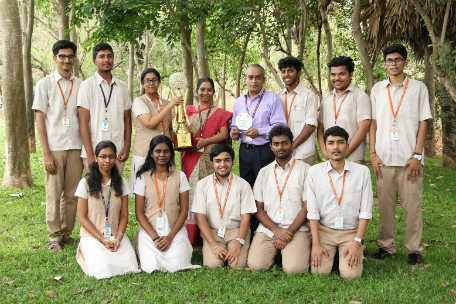 While three teams of six students each from Amrita Vishwa Vidyapeetham won awards at the event, three others featured in the top 10 teams in India for various ministries. The Andorid app Niryatak, developed by Amrita Vishwa Vidyapeetham’s team of second-year B.Tech students for Indian exporters and manufacturers, won the top prize in response to a challenge posed by the Ministry of Commerce & Industry, Govt. of India. The app helps calculate the correct post-production cost of any product being exported and suggests what the selling price should be for optimum profit. The app has features such as a live in-built map to show optimum routes for transport of goods to the nearest port and the latest currency exchange rates. Another team of six third-year B.Tech students from Amrita Vishwa Vidyapeetham – which named itself Cyber Sena – won the top award at Smart India Hackathon 2018 by developing a secure system for the Ministry of Defence. The solution enables easy transfer of data from one network to another through white-listing of pen drives. Yet another team from Amrita Vishwa Vidyapeetham won the special award in the Students’ Innovation Category for developing an app for the Ministry of AYUSH for conversions of Ayurveda unit. Three more teams from Amrita featured in the top 10 teams in India for various ministries. SIH 2018 was a gruelling 36-hour hackathon held at 28 centres all over India, with over 100,000 students divided into 12,000 teams participating. About 340 problem statements were provided by 28 union ministries and 18 state governments and the top 5 percent teams were selected for the grand finale in 28 centres across India. It is expected that over 100 innovations and apps from the SIH 2018 edition will be put into deployment by the Governments. Great job Amrita. Congratulations, Keep it up.